The 'M' Word - Marketing Libraries: Are we holding our customers captive? Are we holding our customers captive? 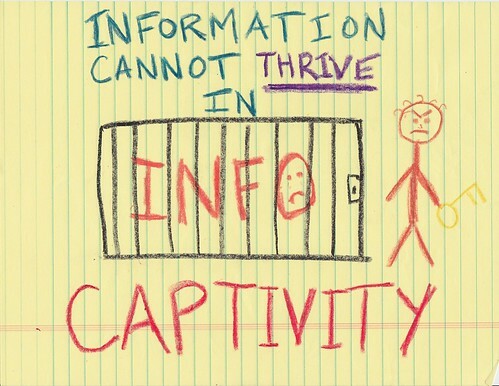 Andy created this drawing and it got me thinking about the whole idea of "information captivity" and that led me to thinking about other things we hold captive in libraries - like our customers. When I was growing up the Post WWII values were all about borrowing. Our country was still adjusting from rationing, factories were trying to churn out goods and neighbors didn't have the money to buy everything they needed so they borrowed. My Uncle Cal had the only freezer in the village with room for ice and everyone was always borrowing a bag of ice. It was normal. Neighbors borrowed wheel barrows and shovels and whatever else was needed. We lived in a world where everyone borrowed. But as our world changed into one of ownership, borrowing began to take on another connotation. People who borrowed were different than those who could afford to own. Perhaps even considered lower on the economic ladder. In some social circles borrowers were considered "cheap" and for some people it no longer felt comfortable to be a lender. Did we in the library field subconsciously make that shift as well? Does it show up in our customer service policies and attitudes? Do we hold our borrowers captive behind the bars of a deep seated belief that since we are providing services and resources our customers can't afford, we are more important to them, then they are to us? I was imagining what we might look like if saw our customers in another light. If we considered developing "Borrowing Plans". Imagine if someone returned overdue books and instead of being charged a fine, that person was offered different borrowing options that matched their lifestyle. For those who liked to borrow a certain amount of books without time limits they could choose a Netflix plan, for those who tended to borrow books before buying they could have a different plan. The idea would be instead of having an inflexible, fine based system that uses fines as the negative motivation to make people fit into our borrowing models, we work to create a system that fits the needs of our customers. Our job would be to look at those borrowing trends and find solutions that work for our customers. Valuing our customers requires us to go deeper than finding the right resources for them, it demands that we recognize what they want, need and desire and begin creating solutions that work for them and stop holding them captive to systems that meet our needs. While your thesis that our perception of patrons' needs is different from their actual needs is valid, the anecdote is pretty silly to me. The Federal Reserve maintains historical data for consumer credit outstanding. No such borrowing apprehension exists. For a close visual approximation, see this graph of Personal Saving Rate. If people save less, it's not unreasonable to think they borrow more. It's difficult to put a number on the value of libraries. You alluded to that in mentioning Netflix; real substitute cost is quite low for what we provide in circulating materials. I'd like to see numbers for libraries' effect on property values, to see if it offsets property tax rates without a patron even walking through the door. Wouldn't that be interesting? Hi Nancy! One thing I am doing this school year in the spirit of your post and Andy's post is working with our teachers to provide extended loan periods for students when independent reading is assigned. Instead of 2 weeks, I am providing a 4 week loan period. In addition, I am telling students as they come to visit us to let us know if they need more than 2 weeks for a book. We are more than happy to customize a loan period if a student needs a longer loan period than 2 weeks. I am hopeful this new approach for 2009-10 will reduce fines and help build even stronger relationships with our students. Thanks to you and Andy for these inspiring ideas! Wow, I love it and can't wait to hear about the response from your students. You've reminded us that change doesn't always have to be big policy changes but can be smaller steps that get the process moving in a forward direction. You could possibly be starting a movement with that idea!